Use Swiggy very frequently? Thinking of getting Swiggy SUPER membership or going to renew your existing one? How would you like Swiggy SUPER membership in just Rs 1? Well, it is not a hoax or prank. You can actually get it with Times Prime. If you are a Times Prime user, you can get 1 Year Swiggy SUPER membership in just Rs 1. Read on to know how and then you won’t have to pay delivery fee on your Swiggy orders. Cheers!!! 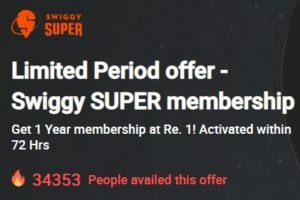 How to get 1 Year Swiggy SUPER membership in just Rs 1? 1. Visit here for offer page. 2. Login/Register with the same mobile no that you have on Swiggy. 3. 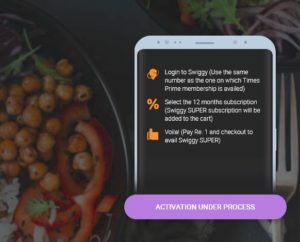 Now, you’ll see an option “Activate Swiggy SUPER” on Times Prime Swiggy SUPER page. Click on it. 4. Within 72 hrs, you’ll receive a confirmation through message. 5. After receiving the confirmation, login to your Swiggy account. 6. Go ahead and buy 1 Year Swiggy SUPER membership. 7. Make the payment of Rs 1 and done!! !